All transactions are safe and secure with a reliable history in online purchasing behind each of our associates. 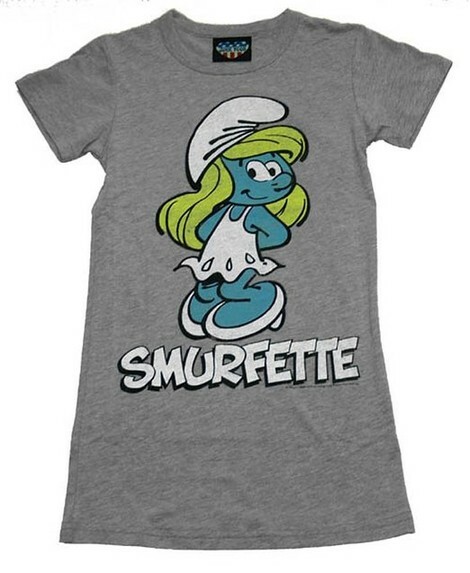 Buy the Smurfette t-shirt to own Smurfs clothing and merchandise. This cute clothing item features our favorite blonde cartoon character, Smurfette. Although she started out as an evil black haired villain sent by Gargamel to ruin the town, Papa Smurf came to the rescue and stopped her dead in her tracks. With a little magic from the elder, she transformed into the blond bombshell we all know and love. As you know, we aren't the only ones who love her either. She has her pick of men, including glasses wearing know-it-all Brainy and tattooed muscle man Hefty, just to name a few. Pair this Smurfette t-shirt with some plush Smurf toy stuffed animals for a great gift. In addition to the Smurfette tee above, browse the Smurfs Clothing Gallery for more apparel like men's and women's clothes, kids shirts or hoodies.